This interview is reprinted from McGaw Graphics interview with me, published on January 26th, 2018. MG: What medium do you work with? HKH: I work with a combination of monoprinting, eco printing and collage. I create the prints using the first two techniques and then select pieces of them to incorporate into a collage, using matte medium to adhere the pieces and to give them a translucent coating. MG: What do you like most about working with this medium? HKH: I love the spontaneity of all three processes. Monoprinting and eco printing allow for unexpected results; areas that are at once delicate and defined and rather gloriously imperfect. Collage allows me to choose evocative parts of each print and piece them together into a new whole, not unlike a quilt. MG: What inspires you most? HKH: My hometown, Davis, CA, is honeycombed with greenbelt paths planted with all manner of trees, shrubs and flowering plants. I spend a lot of time walking the paths around my home and studio, studying the sky, the changing colors of leaves as they bud, leaf out, and finally fall, where, after the first rain, they leave haunting imprints of themselves. There is a pond on the greenbelt populated by Canada geese, wild turkeys, herons and any number of other birds, making the walk not only visually inspiring but filled with bird call, chirrups and honks. The time of dusk in winter is one of the most evocative times to walk. Crows fly overhead, bats begin their nightly flights; all against the stark outline of tree branches and the delicate colors of twilight. I try to bring these impressions back to the studio to distill the essence of them in my work. MG: What artists inspire you? HKH: What a difficult question! So many! I’m fortunate to live in a town with many excellent artists whose work I adore: Sara Post, Rebecca Ryland, Stacey Vetter, Diana Jahns, and Linda Clark Johnson. Further out, ecoprinter Lotta Helleberg in Virginia, SF artist, Tracey Adams, and even further out in Australia, botanical artist Leslie Kendall. I have always been inspired by Paul Klee, Mark Rothko, Pierre Bonnard, and Jean-Baptiste-Siméon Chardin, the 18th century French painter. Then in a whole other category, the Indian artists who painted Tantric gouache works and the art of the Amish quilt makers. MG: What are your hobbies (besides art)? HKH: Traveling and walking in beautiful places both cultivated and wild. I love botanical gardens and spend a lot of time in the San Francisco Botanical Garden. I enjoy exploring the back streets of San Francisco, discovering odd bits of flotsam for collage, small architectural wonders and hiking up the many hills for the views. I’m a yoga enthusiast and find that whatever is going on, time in our local studio, or on the road, helps to iron out the wrinkles of life. I’m also a passionate reader and enjoy spending the evening reading a good book with real paper and print that I can touch. HKH: When I was in college, I wanted to have a carriage house as a studio. I have the closest thing in the modern vernacular; the ample space above our garage. Spacious, with a slanted ceiling, there is a wall of windows looking out to the alley and a beautiful olive tree. As I enter my studio, to one side, I have a wall of books, watercolors, paints, and supplies. On the other side of the door, my inspiration: a wall covered with postcards of artists’ exhibits and artwork catches my eye. I have several tables holding current projects and work between them and a display wall. Finally, the last wall has shelving and storage for current and older work. There’s also more storage underneath the windows (more books!) and small niches with objects that keep me inspired. MG: How many years have you been an artist? MG: What jobs have you done besides being an artist? 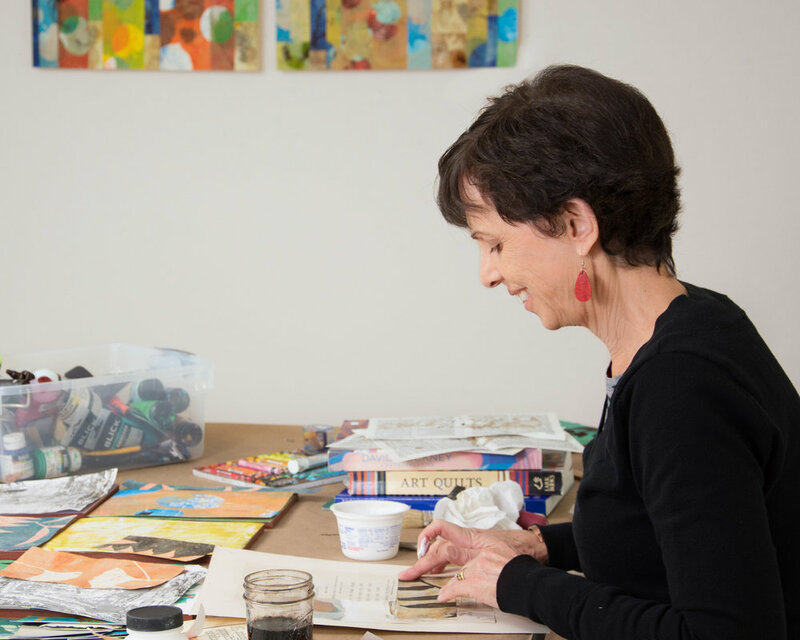 HKH: I love teaching art and I’m also a trained art therapist. I worked for many years as the pediatric art therapist for UC Davis Children’s Hospital. I’ve also worked for several area hospices, creating art therapy bereavement programs for children and young adults. After retiring from UC Davis, I’ve continued to offer once-a-month workshops at a non-profit that serves cancer patients. Despite the sound of all this, it is fun and very rewarding work. Going further back, I was a restorer of oriental rugs and a short order cook! MG: If you were not an artist what would you do? HKH: I’d be a yoga teacher—healing and art, body and mind all combined. MG: What is your dream project? HKH: I’d like to do a residency at the Bloedel Reserve in Bainbridge, WA or a similar setting and create a suite of work, which acknowledges climate change while celebrating the exquisite beauty of plants; how moment by moment, they support our life on this planet. MG: Is there a painting or project that you are especially proud of? HKH: This past summer, I was commissioned by NYU Langone Medical Center to create a series of monoprint collages for a new cancer center opening on Long Island. Because of my work with cancer patients, this project brought together my love for healing, color, pattern and creating beauty for people who can use it as part of their healing process. It was wonderful. MG: What is your favorite color?